Samsung India today announced the launch of Galaxy Tab Iris featuring iris-recognition technology that is ready for Aadhaar authentication through an integrated and highly secure biometric device. The Galaxy Tab Iris will provide cashless and paperless services in various applications such as banking, eGovernance services such as passport, taxation, healthcare and education. The easy-to-use biometric technology, currently incorporated in the Galaxy Tab Iris will help India spread its Digital India vision of providing technology so that every citizen of the country can have access to financial inclusion benefits. The solution will support government benefit programs and enable banks and financial institutions to streamline the process of an individual’s authentication, regardless of language and literacy barriers. The device is Aadhaar-compliant and STQC-certified. Galaxy Tab Iris is yet another Make for India innovation from Samsung. Embedded in a secure device, the advanced iris-recognition technology will provide an integrated solution that will help to solve the hassles of using separate devices for biometric identification. “Along with the device, we are providing an Identity SDK for application developers to build financial inclusion, payments and authentication solutions. This will encourage our start-up ecosystem to rapidly build relevant apps and services. We strongly believe this overall offering will in turn strengthen government programs such as Jan-Dhan Yojana and E-Citizen services under the Digital India initiative,” he said. The Samsung Galaxy Tab Iris powered by iris technology will enable users to access services remotely by embedding Aadhaar iris-biometric authentication capabilities. This alignment will provide a more secure authentication and verification process and help the country transition away from traditional authentication processes. It is a breakthrough technology as E-KYC can be carried out in seconds whereas the traditional KYC takes up to 2 to 7 days. The Galaxy Tab Iris is UIDAI compliant. It can be used for child enrolment program where biometrics of the parent is used to authenticate children for Aadhaar enrolment. The tablet will negate the need for multiple pieces of equipment by providing an integrated solution for the child enrolment process. Biometrics is playing a major role in the banking sector to improve speed and security. The capability of the Galaxy Tab Iris is to function as an authentication device enabling banks and financial institutions to easily authenticate an individual’s data for account integration with their Aadhaar numbers as well as provide an additional layer of security for banking services such as locker access, fixed deposits, where authentication is required. The iris-recognition technology will also further reduce the need for cumbersome paperwork, allowing people to enrol for banking and financial services in a more efficient paperless manner. With the majority of these processes being digitized with the use of the Galaxy Tab Iris, language and literacy barriers will no longer be an issue, allowing a larger section of the society to available services, promoting inclusion and financial security. The Galaxy Tab Iris can be used for accessing citizen services for purposes ranging from E-PDS (Electronic Public Distribution system), MNREGA (Mahatma Gandhi National Rural employment Guarantee Act) payments, pension schemes, various subsidy programmes and entitlements distribution. Multiple citizen services such as income tax filing, passport issuance/renewal, car registration, property registration, railway/airport passenger verification can be made paperless with the use of the Aadhaar based Iris technology. The Galaxy Tab Iris is a sleek, compact tablet with a robust design and powerful technology. The dual-eye scanner provides for a contactless scan and greater security. The tablet also sports a vivid 7.0-inch display providing precise details for a good screen experience, along with a 5-megapixel auto focus rear camera for clicking brighter pictures and scanning documents. It delivers true value and is complemented by its extremely light, easy-to-carry 327g weight and slim 9.7mm profile. USB OTG Host ensures extra attachments support while Bluetooth 4.1 low energy offers optimum connectivity. The tab surpasses the language barrier with support of 14 local languages and a host of other useful features. The device comes with an 8GB memory, up to 200GB expandable memory and a strong 3600mAh battery. 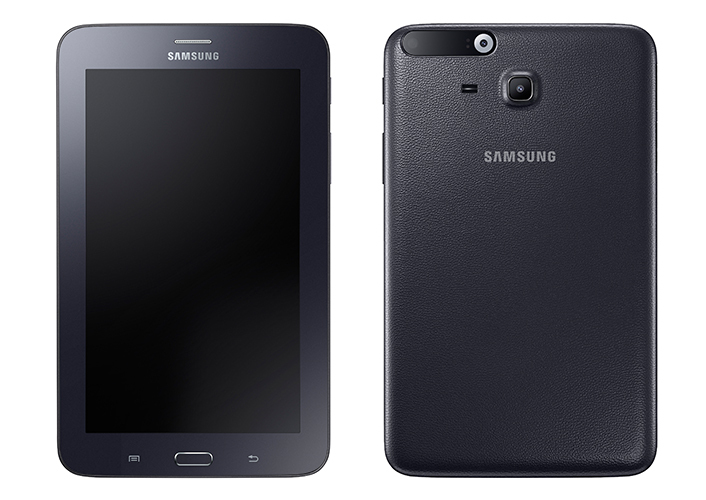 The Samsung Galaxy Tab Iris is priced at INR 13,499.